The squadron traces its lineage to the United States Army Air Service's 17th and 147th Aero Squadrons, both of which were active during World War I. The 147th was redesignated the 17th Pursuit Squadron in the post-war Air Service and later consolidated with the 17th Aero Squadron in 1936 to preserve the history of both pursuit units. The 17th Aero Squadron was activated in August 1917 and earned 13 campaign streamers in France flying the Sopwith Camel. The 147th Aero Squadron was organized in November 1917 and flew the Nieuport 28 and SPAD S.XIII fighters, earning eight streamers. During World War II, the 17th Pursuit Squadron participated in the defense of the Philippines flying the Curtiss P-40 Warhawk and garnering the first American Ace of World War II. Wiped out during the Battle of the Philippines, some of its squadron members endured the Bataan Death March. Reactivated during the Vietnam War, the squadron went on to fly Republic F-105F Thunderchief Wild Weasel aircraft, and in Operation Desert Storm flying the General Dynamics F-16C Fighting Falcon. Flying the McDonnell Douglas F-15E Strike Eagle, the squadron accomplishes its mission by providing graduate-level instructor academic and flying courses to USAF Combat Air Forces (CAF). The squadron conducts extensive technical off-station training and liaises with CAF units. The 17th emblem, modified from the one adopted in 1917, consists of a Great White Snowy Owl in front of a black triangle with a blue background. Because of its distinctive Owl Patch, the squadron's nickname is the Hooters. Company A, Remount Station, Fort Sam Houston, Texas was organized on 13 May 1917, about a month after President Wilson declared war on Germany. It was later redesignated Company M, and later, Company B. On 16 June, its personnel were organized as the 29th Provisional Aero Squadron, Aviation Section, Signal Corps, which was redesignated the 17th Aero Squadron on 30 July. It was made of entirely of volunteers. 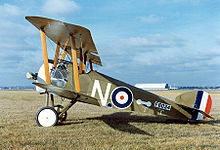 The unit was the first United States aero squadron sent to Canada to be trained by the British; the first squadron to be completely trained prior to be sent overseas with its complete quota of trained pilots; the first squadron to be attached to British Royal Air Force (RAF) squadrons and the first to be sent into combat. The squadron entered combat as a pursuit unit with British Second and Third Armies from 15 July-28 October 1918 seeing extensive combat during the Battle of the Somme while serving with the RAF. In October 1918 the squadron was requested by the Americans to be transferred to the American Expeditionary Forces (AEF) and it was reassigned to Second Army on 1 November 1918 and prepared for operations on American front but did not become combat-ready before the end of hostilities on 11 November 1918. It was demobilized in 1919. One of the aces serving in the squadron during World War I was Robert Miles Todd. On 17 October 1936, the World War I 17th Aero Squadron was consolidated with the United States Army Air Corps 17th Pursuit Squadron. The 147th Aero Squadron was organized at Kelly Field, Texas on 11 November 1917. It was ordered directly to Fort Worth, Texas for training at Everman Field #2, Camp Taliaferro. It trained in Texas until February 1918, when it deployed to France, where additional training was received. It became part of the 1st Pursuit Group in June. Initially flying French Nieuport 28 pursuit aircraft, the squadron was heavily engaged in combat in the Toul Sector and the Aisne-Marne Sector. It was part of the defense against the German offensive in mid-July in the Champagne-Marne, then went on the offensive during the Aisne-Marne during July. It took part in the St. Mihiel offensive, and the great American Meuse-Argonne Offensive which continued until the Armistice with Germany on 11 November 1918. During its time in combat, the squadron gained 62 victories and suffered nine casualties. The squadron flew 2,000 combat hours. After returning to the United States in April 1919 nearly all of the 147th's personnel were demobilized. The War Department created a new 1st Pursuit Group between late April and mid-August 1919 when it dispatched a small cadre of personnel to Selfridge Field, Michigan. New recruits and veterans from other flying units became members of the new 147th Squadron, and by late summer the process was complete. However, on 28 August, the squadron departed by train to Kelly Field, Texas where it became part of the new Advanced Pursuit Training School. At Kelly Field, the squadron was assigned to the re-formed 1st Pursuit Group, effective 22 August 1919. The pursuit school was the first step in building a new permanent air service and by providing a course of instruction for pilots at Kelly, it was a way to transfer the hard-earned knowledge gained during World War I to a new generation of fliers. Pilots received hands-on experience in aircraft and engine maintenance. They also flew a training program that covered formation flying, aerobatics, air-to-air and air to ground gunnery, reconnaissance and patrol tactics. The aircraft used were British Royal Aircraft Factory S.E.5s and U.S.-built Airco DH.4s that were excess from the war effort. On 14 March 1921, the 147th was redesignated as the 17th Squadron (Pursuit) and in July the 1st Pursuit Group moved from Kelly to Ellington Field, near Houston, Texas. In June, 1922, the 1st Group prepared to return to Selfridge. The four squadrons of the group (17th, 27th, 94th and 95th) departed Ellington on 24 June. The long deployment to Michigan was a novelty, and the press followed the group's progress closely. The group arrived at Selfridge Field on 1 July 1922. Selfridge served as the 1st Pursuit Group's home for many years. As the Army's only pursuit group, the War Department took special pains to ensure that it was maintained in a high state of readiness. On 21 January 1924, the War Department sanctioned unit emblems. The "Great Snow Owl", chosen by the World War I 17th Pursuit Group as its emblem when transferred to the American Expeditionary Forces in 1918 was adopted by the 17th Pursuit Squadron on 4 March 1924. In May 1924, the group opened a satellite airfield at Oscoda, Michigan to function as an aerial gunnery camp for the unit. Loud-Reames Aviation Field was renamed Camp Skeel, for World War I pilot Captain Burt E. Skeel, and was used as an aerial gunnery range and for winter maneuvers by the 1st Pursuit Group. During World War II, the facility would be expanded as Oscoda Army Air Field, as a training base. After the war, it would be expanded and become Wurtsmith Air Force Base. During the 1920s, the unit participated in exercises, demonstrations, and maneuvers, events the War Department used as combined training and public relations exercises. Public and congressional interest in aviation was high. Equipped with fast, nimble, pursuit planes such as the Curtiss P-1 Hawk, the unit attracted the attention of the public wherever it appeared. Overall, the Twenties were a productive decade for the unit. The 1st Pursuit Group responded well to being the Air Corps' only group-level pursuit organization, and developed a well-trained force that responded to the demands placed on it. The 1930s produced a different set of challenges. During the Thirties, the group introduced at least six new aircraft into the Air Corps inventory. It also provided personnel for newly formed squadrons and groups. The onset of the Great Depression gave the unit additional responsibilities in 1931, the group participated in several air shows staged to benefit the unemployed. Squadron involvement ranged from two- and four-ship flights to squadron deployments. Beginning in 1933, the unit saw a handful of its officers detailed to work with the Civilian Conservation Corps, a New Deal program designed to put unemployed youths to work on various conservation projects. The Curtiss P-6E Hawks flown by the squadron were improvements in the line of Hawks since the squadron received the P-1 in 1925. In 1934, it converted to the Boeing P-26A Peashooter, a low-wing, all-metal monoplane, and in 1937, it received the Seversky P-35, the first single-seat fighter in U.S. Army Air Corps to feature all-metal construction, retractable landing gear and an enclosed cockpit. 17 October 1936 saw the Air Corps formally consolidate the 17th Pursuit Squadron with the World War I 17th Aero Squadron. With the consolidation, the combat history and lineage of its World War I predecessor became a part of the 17th. The growing threat of war with the Japanese Empire in the Philippine Islands led to the 17th Squadron to be relieved from assignment to the 1st Pursuit Group and transferred to the Philippine Department. Leaving Selfridge on 31 October, the squadron was reassigned to the 4th Composite Group at Nichols Field, near Manila in the Philippines, on 14 December 1940. P-35s of the 17th Pursuit Squadron, 1941. The 17th Pursuit Squadron had been sent overseas without aircraft to fly Seversky P-35s that had been held back from a sale to Sweden to reinforce the Philippines. Until their aircraft arrived and were assembled in March 1941, they practiced in the Boeing P-26 Peashooters that then constituted the interceptor force at Nichols Field. By late 1941 standards, the P-35A was hopelessly obsolescent. It was too lightly armed and lacked either armor around the cockpit or self-sealing fuel tanks, and the instruments of the aircraft flown by the 17th were marked in Swedish and calibrated in the metric system. When new Curtiss P-40E Warhawks arrived in September 1941, the 17th was happy to hand down the Severskys to the 34th Pursuit Squadron, recently arrived from the United States without its aircraft. With the 3d and 20th Pursuit Squadrons, the 17th formed the interceptor component of the Philippine Department's 4th Composite Group. On 1 October 1941 the squadrons were reassigned to the newly created 24th Pursuit Group and became part of the Far East Air Force (FEAF) when it stood up in November. After word was received of the attack on Pearl Harbor, FEAF units gathered in anticipation of the Japanese attack everyone knew would be coming. However, attack orders against known Japanese forces on Formosa were not forthcoming. "We can't attack till we're fired on". By 11:00 am both the 20th and 17th Pursuit Squadrons were on the ground at Clark Field. Both had been flying patrol missions during the morning and needed to refuel. While the planes were being serviced, the pilots had gone after food; but as soon as they had eaten, they returned to their planes and went on alert. The 17th, who had refueled first, was ready to go. About 11:30 am, a message from Iba Field reported a large formation of planes heading west over the China Sea, heading presumably for Manila. The 17th was ordered into the air to patrol over the Bataan Peninsula and the entrance to Manila Bay and intercept whatever the Japanese tried to send though. At that moment, the first formation of Japanese bombers appeared over Clark Field. They came over the unprotected field in a V-formation at a height estimated at 22,000 to 25,000 feet, dropping their bombs on the aircraft and buildings below, just as the air raid warning sounded. As at Pearl Harbor, the Japanese achieved complete tactical surprise. The 17th and 21st Pursuit Squadrons, on patrol over Bataan and Manila, made no effort to attack the Japanese aircraft when warning of the raid did not reach them in time to render aid. 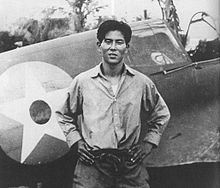 The Japanese followed up their success of the first day of war with air attacks that completed the destruction of American airpower in the Philippines. Before dawn of the 9th, seven Japanese naval bombers struck Nichols Field near Manila, opening the next round, but the remainder of that day's attackers were grounded on Taiwan by fog. On the 10th they struck Nichols and Del Carmen Airfields in full force in the early afternoon. The pattern set at Clark Field two days earlier was repeated. High-level bombers came in first and hit the barracks, offices, and warehouses. The fighters then came in at low level to strafe the grounded planes and installations. An entire flight of 17th planes returning to refuel was shot down by Zeros, although all the pilots survived. There was no antiaircraft fire and no fighter protection over the field. By this time American airpower was at a low ebb. There were only 22 P-40s in commission, with six more promised if they could be repaired in time. With FEAF thus reduced in strength, it was decided to use the remaining planes for reconnaissance in order to conserve them as long as possible. The pursuit planes were based at Clark and Nichols, and the heavy bombers were withdrawn to Del Monte. On the morning of the 12th, few American planes remained to hinder the Japanese. With almost all of the squadron's aircraft destroyed, the men of the ground echelon were pressed into service as ground infantry under 5th Interceptor Command. On Christmas Eve of 1941, the 17th's ground echelon evacuated Nielson Field and went by train to Bataan. There they took part in the Battle of the Philippines (1941–42). However, most of its aircraft were destroyed on the ground, by Japanese air raids. Some 17th personnel later fought as infantry during the Battle of Bataan and, after their surrender, were subjected to the Bataan Death March. Other members of the 17th escaped to Australia, where they collected new P-40s (see Pensacola Convoy) and reformed as the 17th Pursuit Squadron (Provisional). In January 1942, the squadron undertook a flight across Australia and the Arafura Sea, to Java and took part in the Dutch East Indies Campaign, where it claimed 49 Japanese aircraft destroyed, for the loss of 17 P-40s. At the end of February, as Japanese ground forces approached, the squadron handed over its surviving aircraft to the Dutch military and returned to Australia. What remained of the 17th Pursuit Squadron was integrated into other American units in Australia. Fifth Air Force carried the squadron as an active, unmanned unit though the end of the war. Lastly, 2 April 1946, the unit was placed in inactive status. It would remain inactive until almost the end of the Vietnam War. It was reactivated on 12 November 1971 as the 17th Wild Weasel Squadron, and assumed the mission, personnel, and Republic F-105G Thunderchief Wild Weasel IV of the inactivating 6010th Wild Weasel Squadron. The mission of the 17th was the destruction of North Vietnamese surface-to-air-missile batteries by destroying or otherwise shutting down their guidance radars, leaving enemy missile sites effectively blind and impotent. The electronic weapons officer in the rear seat of the Wild Weasel F-105G operated a battery of sophisticated electronic equipment which was capable of detecting the emissions from enemy radars and determining the exact location of their sources. Once these sites were identified, the Wild Weasel aircraft could attack them with a battery of AGM-45 Shrike anti-radar missiles, which were designed to home in on an enemy radar transmission and follow it all the way to its source and destroy it. The Wild Weasel aircraft would also carry powerful jamming equipment which was designed to confuse the enemy radar installation or to misdirect any surface-to-air missiles that might be launched. Alternatively, the Wild Weasel crew could direct other aircraft toward the missile sites, which would be attacked by iron bombs or cannon fire. After the end of American military flights over North Vietnam in January 1973, the squadron maintained the capability to deliver Wild Weasel support for operations over Cambodia of Boeing B-52 Stratofortress, General Dynamics F-111 Aardvark, and McDonnell F-4 Phantom II aircraft until August 1973. It maintained an alert mission until the squadron was inactivated in 1974. The squadron's aircraft were returned to the United States, being assigned to the 35th Tactical Fighter Wing at George Air Force Base, California. Reactivated as the 17th Tactical Fighter Squadron in early 1982 at Shaw Air Force Base, South Carolina, assigned to the newly redesignated 363d Tactical Fighter Wing as the wing was converting from a McDonnell RF-4C Phantom II tactical reconnaissance mission to General Dynamics F-16 Fighting Falcons. The initial aircraft received were Block 10 F-16A models, but shortly afterwards the first block 15 aircraft started to arrive. The responsibility of the 17th was close air support, air interdiction, suppression of enemy air defenses and armed reconnaissance to support worldwide contingencies. For this mission the squadron was eventually equipped with Block 50 aircraft and the AGM-45 Shrike anti-radiation missile. This was one of a few units within the USAF that flew with this missile. In 1985 the squadron was upgraded to the Block 25 F-16C from the General Dynamics factory in Fort Worth. These aircraft were more capable in comparison with the former block 15 models. Also new weapon systems could now be introduced, like the CBU-87 Combined Effects Munition. After the Iraqi invasion of Kuwait in August 1990, the 24 aircraft of the 17th were deployed to Al Dhafra Air Base, Abu Dhabi, United Arab Emirates on 9 August 1990 and started flying air defense missions over the Saudi kingdom as part of Operation Desert Shield. When Operation Desert Storm started in January 1991 the squadron was at the forefront of air operations. Upon their return to the United States, in March 1991, the squadron started receiving some brand-new block 42 F-16s. Their primary mission of air interdiction remained the same. During 1993 the first rumors came that the entire wing was to be disbanded. The news was quickly acknowledged. On 31 December 1993 the squadron was inactivated in favor of squadrons from the senior 20th Fighter Wing, which was moving from the closed RAF Upper Heyford, England to Shaw as part of the USAFE drawdown at the end of the Cold War. The squadron transferred its aircraft and personnel to the 20th, and the 363d Wing was inactivated. ^ Aircraft is McDonnell Douglas F-15E-50-MC Strike Eagle serial 90-0257. ^ The official approved emblem merely noted the owl was on a black background, but the squadron used a white-bordered triagle as the background. Maurer, p.96. See 17th Aero Squadron emblem. ^ Aircraft is Curtiss P-6E Hawk serial 32-261, displayed at the National Museum of the United States Air Force in the colors and markings of the airplane assigned to Capt. Ross G. Hoyt, the 17th's commanding officer at Selfridge Field, MI in 1933. ^ Sasai had downed a 17th Squadron P-40 on February 18, 1942. ^ Aircraft is Republic F-105G Thunderchief serial 62-4225 on the last day of the Linebacker II raids, 29 December 1972. It is now on display at Blissfield, MI. ^ Aircraft is General Dynamics Block 42J F-16C Fighting Falcon serial 90-754. ^ a b c "World War I Aero Squadrons". Cross and Cockade Journal. Society of World War I Aero Historians. Vol. 5 (Number 2): 145. 1964. ^ a b c d e f g h i j k l m n o p q r s t u v w x y z aa ab ac ad ae af ag ah ai Bailey, Carl E. (4 January 2008). "Factsheet 17 Weapons Squadron (ACC)". Air Force Historical Research Agency. Retrieved 7 May 2018. ^ Franks & Bailey, pp. 76-77. ^ a b Assignment information in Bailey, except as noted. Edmonds, Walter D. (1992) . The Fought With What They Had: The Story of the Army Air Forces in the Southwest Pacific 1941-1942 (PDF) (reprint ed.). Washington, DC: Center for Air Force History. Retrieved 7 February 2018. Franks, Norman; Bailey, Frank W. Over the Front: A Complete Record of the Fighter Aces and Units of the United States and French Air Services, 1914–1918 Grub Street, 1992. ISBN 0-948817-54-2, ISBN 978-0-948817-54-0. Gorrell, Col. Edgar S. (1974). History of the American Expeditionary Forces Air Service, 1917-1919. Series E: Squadron Histories. Vol. 4 Histories of the 16th, 17th and 19th-20th Aero Squadrons. Washington, DC: National Archives and Records Service, General Services Administration. OCLC 215070705. Gorrell, Col. Edgar S. (1974). History of the American Expeditionary Forces Air Service, 1917-1919. Series E: Squadron Histories. Vol. 18 History of the 147th Aero Squadron. Washington, DC: National Archives and Records Service, General Services Administration. OCLC 215070705. Hewitt, William A (1992). Planting the Seeds of SEAD: The Wild Weasel in Vietnam (PDF). Maxwell AFB, AL: School of Advanced Aerospace Studies, Air University. ISBN 978-1249328094. Retrieved 5 October 2009. Morton, Louis (1953). "V. The First Days of the War". The Fall of the Philippines. The War in the Pacific. Washington, DC: Center of Military History,, United States Army. LCCN 53-063678. Retrieved 7 May 2018. Watson, Richard L. (1948). "Prelude to War, Chapter 6, Pearl Harbor and Clark Field". In Craven, Wesley F; Cate, James L (eds.). The Army Air Forces in World War II (PDF). Vol. I, Plans and Early Operations. Chicago, IL: University of Chicago Press. LCCN 48003657. OCLC 704158. Retrieved 17 December 2016. War Department (1920). Battle Participation of Organizations of the American Expeditionary Forces in France, Belgium and Italy, 1917–1919 (PDF). Washington DC: Government Printing Office. OCLC 118250. Retrieved 4 December 2016.